I get asked almost on a daily basis on how I got my Facebook business page verified. It's actually a quick and (generally) painless process that can significantly increase your credibility. Given how simple it is to get your Facebook page verified, I encourage all qualified page owners to give it a try. In this post I will teach you how I took my online invoicing company from a non-verified page to a now verified page in a few simple steps. What kind of verification do I need? You may have noticed that pages have basically two different types of badges: a grey checkmark or a blue one. A blue badge next to a page name indicates the authenticity of a global brand, media company or public figure. Some examples of high-profile pages that have the blue badge include Rihanna (public figure), Fox News (media outlet) and Coca-Cola (global brand). A gray badge, on the other hand, confirms the authenticity of a local business or organization. Basically, if you can provide documentation to show that you're a legitimate local business, you should apply for the grey badge. Some global brands may actually have both types of badges. If they use parent/child pages (known as Location pages), the parent page will display a blue badge, while the individual location pages will display the grey local business badge. If these three elements are in place (and assuming you're the admin of the page), you should see the option to verify in your page's settings. Simply click on "Settings" at the top right of your page, then "General," then "Page Verification." Click on "Verify this page" or "Edit" (if you don't see the, 'Verify this page' link). You'll then be asked to provide a publicly-listed phone number for your business, your country and your language. If you don't have a publicly listed number, or you simply prefer to verify your page using documentation, you can also do this here. Finally, click "Call me now" to have Facebook send you a 4-digit verification code. Enter this code and you're done! Facebook will usually let you know within a few days if your verification has been completed. While getting your page verified as a local business is relatively straightforward, receiving that coveted blue badge can be a little trickier. Many people are under the impression that Facebook awards these badges of their own accord. And while it's true that they often automatically verify pages for well-known celebrities and brands, there is a way to manually apply as well. Your first step will be to see if Facebook deems your page eligible for verification. Simply go to the Request a Verified Badge form (make sure you're logged in using your admin account) and see whether you have any eligible pages. If it shows you're not eligible don't worry - you aren't out of options yet. I've recently heard from several sources that purchasing some Facebook ads through your page (even a small amount) is also advisable. While I can't confirm this, it certainly won't hurt your chances! If some time has passed since you started this process, you can go back to the verification request form to see if your page has been deemed eligible. 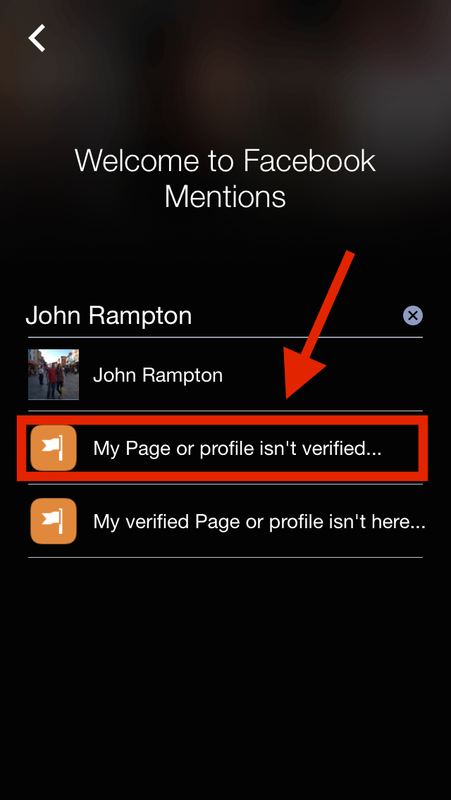 If it hasn't, you'll need to use the Facebook Mentions app to apply (thanks Leonard Kim for this tip!). Simply download the app, enter your name, and select "My Page or profile isn't verified." Click "Send" and you're done! While verification isn't an absolute necessity, it does give your page an added boost of credibility. Verifying as a local business is quick and easy, and you can get your grey badge within just a few days. Getting that blue badge can be a lot trickier, but using the tips above should help you. Have you had success verifying your page? Are you verified as a public figure or local business?